A healthy company runs like a well-tuned musical ensemble—and retention is one of the major concerns directors in both cases. Let’s say you’re running a school choir program. You recruit all year to grow healthy numbers in your organization. You strive to find incredible singers who not only have a strong voice but also possess a good work ethic and positive attitude. When you find these unicorns, you put them into leadership and empower them to lead small groups. You ensure that each small group blends well together and helps balance the choir as a whole. Then, registration time rolls around, and you panic. You learn that you’re losing a third of your singers next season. They’re moving on to band, volleyball, Spanish… and leaving your program with a gaping hole where their talent, leadership, and experience used to be. Now, you have to hustle. You’re looking everywhere for good singers who aren’t already signed up for other electives. You’re asking students to recruit their classmates, friends, sisters, cousins. This situation keeps you up at night and wreaks havoc on your choir’s performance in annual competitions. As this begins to happen year after year, you wonder if there’s something wrong with you or your program that’s making singers leave after only one season. You’ve got a serious problem with turnover. Replace “choir” with “company,” and you will immediately see why employee retention is important for your sanity as well as the health of your business. Healthy retention rates help your company succeed in a myriad of ways. The top three areas that are impacted the most by longevity (or lack thereof) are morale, growth, and the company pocketbook. The morale boost created by high and healthy retention rates is subtle. We often notice it only when it’s gone. Employee turnover causes an instant and predictable pattern of low morale throughout a company and takes a lot of strategic damage control to resolve. CEOs see this happen when their star manager accepts a bigger opportunity elsewhere, or when a disgruntled employee quits and takes four of their closest friends with them. Gossip and doubt run rampant in the wake of either event—and from a leadership standpoint, this low employee motivation can look like sudden death. Increasing employee loyalty is important because it makes your company look like a comfortable, fulfilling, and viable option for an employee’s long term growth. It allows for meaningful relationships to develop between coworkers and managers. Retention, furthermore, brings a sense of security to your workplace and inspires employees to see your company as a place they can call home. And when retention rates are high in general, your team is far more likely to react gracefully when an employee does choose to leave the fold. When you successfully retain employees over several years, you also tap into the powerful principle of exponential growth. When plotting a new hire’s productivity and experience over time, you’ll notice the graph flattened out at zero during the onboarding phase. From there, productivity rises steadily up and to the right—but with additional training, experience, goal setting, and increased engagement over time, an employee’s productivity can grow exponentially. This concept can be further illustrated by considering an employee’s relative “worth” to a company. They start in the negative, costing a huge initial investment in hiring and training costs. It takes months of revenue-generating work before the employee “breaks even” and has earned enough to cover the initial investment made by the company. After that point, everything the employee produces is of bonus value—and as experience and capability grow, their value skyrockets. Multiplied across teams and departments, this has a huge impact on the growth of your company as a whole. In the case of our choir director, this would mean that after two years developing a group of all-star singers, you’re able to perform Bach’s B Minor Mass when your choir previously struggled with simple English folk songs. Productivity and monetary value are important. However, these constructs don’t encompass the intangible benefit of creativity, innovation, and problem-solving that a long-term employee brings to the table. In short, a veteran team member with five years of growth and experience at your company is worth immeasurably more than five employees who stay with your company for one year. The third reason retention matters is because it costs (or saves) a ton of cash in your annual budget. This may be the most tangible and the most important reason to focus on improving your retention rates across the board. Hiring employees costs money, and training them to fluency costs even more. 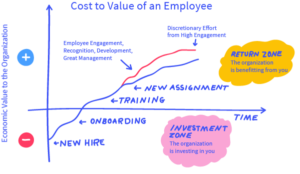 Ideally, you want to retain each employee for long enough that they pass the point of “breaking even” in our value construct above. This usually occurs somewhere after the one-year mark. If you’re losing employees before that point, you’ll find that HR costs represent a growing black hole in your budget. Now, turn that situation on its head. You have healthy and high retention rates. You’re saving innumerable dollars in recruiting, hiring, and onboarding costs, and your employees are ever-growing in experience and productivity. You’ve freed up a huge segment of your budget that you can invest back into the business. If your veteran employees were growing in value before, they’ve now become priceless. Employee retention is absolutely crucial to the health of your company. It’s time to start investing in ways to retain your best employees so you can start reaping big benefits in morale, growth, and financial health. One of the most effective employee retention strategies is creating a culture of respect and appreciation in your company. More than pay raises or in-office perks, a culture of recognition motivates employees to work harder and feel inspired to give more of their time to your company. It’s one of the benefits that matter most to your employees. The easiest way to infuse your culture with appreciation is to employ a high-quality employee recognition program. A fantastic employee rewards program integrates seamlessly with your corporate structure and enables you and your employees to set meaningful, achievable goals. It rewards employees at all levels of experience for their hard work and provides valuable rewards that motivate others to participate. Most importantly, it makes your employees feel seen and appreciated—and that’s what will impact your retention rates over time. At Inproma, we’re experts at creating employee incentive programs that change the way employees feel about their jobs. We work with companies of all sizes to motivate, engage, and retain their best employees, and to provide rewards that encourage individuals to stick around for more. Want to get your company involved? Let’s talk. PreviousPrevious post:What a Healthy Employee Retention Rate Says About Your CompanyNextNext post:What are the Long-Term Benefits of Team Building in the Workplace?